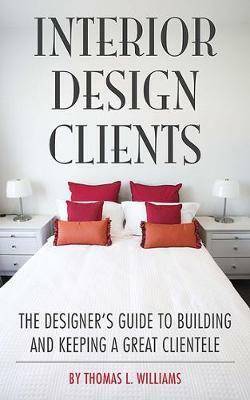 This title is filled with expert advice and proven methods for developing a devoted and growing clientele for your design practice. Clients are the lifeblood of any interior design firm, and a sound understanding of how to manage those clients is essential to continued success. "Interior Design Clients" is an informative yet easy-going volume that will provide entrepreneurial designers with the knowledge and understanding of how to build and maintain a profitable client base. By way of frank discussion and practical examples, this volume offers expert guidance on aspects of the business rarely addressed in design schools, including presentation and interview skills, and how to market yourself. With its fundamental lessons and innovative solutions, this is a must-have for all designers who want to succeed in the ultra-competitive world of modern interior design. Thomas L. Williams is a professional interior designer with more than 30 years experience running his own design firms in the UK & USA.